The current stage of development of the world economy is characterized as the “experience economy”. The new economic structure has a high demand for irrational forms of labour that cannot be algorithmized. To overcome the tendencies towards transformation of architecture into the sphere of precariat, it is necessary to drastically change the methods and the ideology of architectural education. The article provides the data of the survey carried out among the students of Moscow Information and Technological University – Moscow Architecture and Construction Institute. The study has shown an extremely high dependence of students on present-day trends, which contradicts their individual preferences. Bulgakova, E. A. (2013). Integration of innovative methods of education in the training of architects. In: Materials of international scientific-methodological conference: E-learning and distance technologies in education: experience and prospects. No. 1. P. 10–13. Bulgakova, E. (2017). Moscow Information and Technological University – Moscow Architecture and Construction Institute Is an Innovative Architectural School. Project Baikal, 14 (53), 54-57. doi:10.7480/projectbaikal.53.12125. Jung, Carl Gustav. (2014). Analytical psychology: its theory and practice with a foreword by Kevin Lu. London; New York: Routledge Classics. Kalyuzhnova, N., Lidin, K, & Sharafutdinov, V. (2012). The image of Russia as a factor of tourist competitiveness. Irkutsk: Publishing house of the ISU. Klingmann, Anna. (2007). Brandscapes: architecture in the experience economy. Published Cambridge, Mass. ; London: MIT. Lidin, K. et al. (2017). Information Flows Balance and Price of Real Estate. Journal of Advanced Research in Law and Economics, Volume VIII, Spring, 2 (24): 496–504. LIDIN, Konstantin; BULGAKOVA, Elena. To Overcome the Precarity. 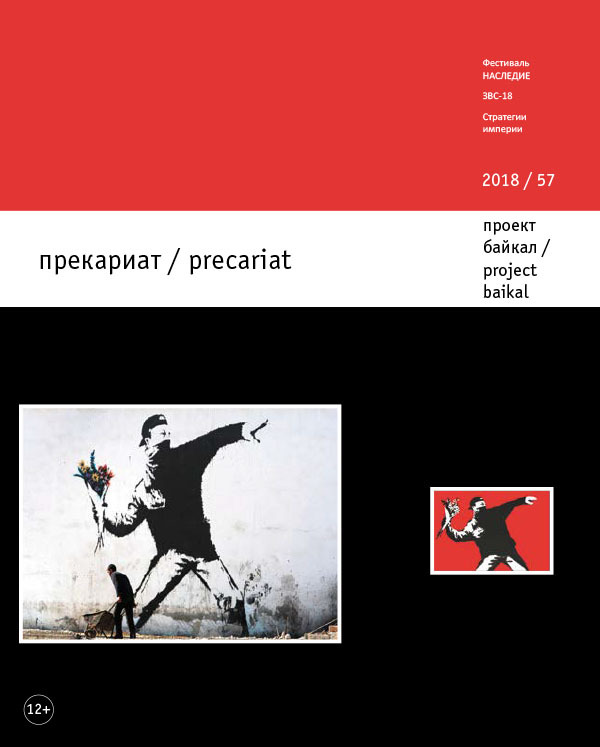 project baikal, Russian Federation, n. 57, p. 150-152, sep. 2018. ISSN 2309-3072. Available at: <http://projectbaikal.com/index.php/pb/article/view/1376>. Date accessed: 24 apr. 2019.